Records management (RM) is one of the many lines of work evolving from basement-born afterthought to imperative business initiative. What are the driving forces behind this change, and how will they impact the role of the records manager? I sat down with Kimberly Samuelson, Director of ECM Strategy here at Laserfiche, to discuss the topic’s increasing relevance in today’s compliance-driven climate. So just to be clear, you’re not a psychic or a time traveler? Not in my 9-5 role. If you don’t have these supernatural capabilities, how do you predict industry trends? I read, a LOT. I look at what’s in the news, I think about what a product is capable of and how to push that. Then I triangulate the three things. 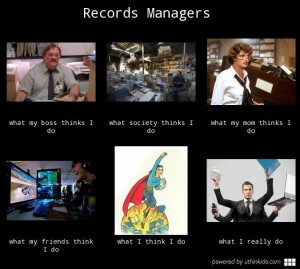 Let’s hear your thoughts on records managers. What kinds of organizations do they work in? Could be private sector, could be public. I think any organization should have records managers in place. A lot don’t. It’s interesting, that role from a historical perspective actually goes back to libraries. You think about Alexandria, that was the great library, the first library in existence. We’ve been managing records as humankind since then. Flash forward from that, you’re seeing records managers who are not only responsible for the intellectual capital for the organization, but who are also getting involved in compliance, service and principled practice. So it’s sort of interesting to see where they’re going. Records managers used to have their own department; they’d sit in the basement and be moles. But now you’re seeing them in Legal because of all the legal ramifications involved in what records an organization has or doesn’t have. A lot of RM is done using technology, and there’s a lot of record-type data that exists as well, so they’re getting involved in IT departments too. So do you see records managers being pulled from those different industries? For example, do you see librarians becoming records managers? Interestingly, I think a lot of records managers are accidental records managers. I don’t think you see the little three year old girl staring dreamily out at the sky at night saying “You know what I want to be when I grow up? I want to be a records manager.” Maybe there are, but I do think there is a specific personality type that does RM well. You like organization, you enjoy putting things into taxonomies, you like categorizing—very Type A. I think that’s the type of person that gravitates toward this job. So what do you think are the primary concerns of records managers besides not being called “bookkeepers” and “basement hoarders”? You could break their concerns into three things: service, profit and the social aspect. In terms of service, records managers are servicing their organization, the public and their customers. They’re making sure the records are consistent, reliable and available. Profit is not necessarily money-making, but the potential cost of non-compliance is mitigated, meaning that the organization is practicing principled practice. 40 years ago, companies hopefully would act in a somewhat ethical manner, and that was just doing business. But now it has a name: principled practice. We look at the financial services industry as being most in the news for doing some things they maybe shouldn’t be doing. The third thing is the social component. Records Managers have always done a good job with explicit knowledge, but the tacit knowledge is what they’ve struggled with keeping. With the help of technology they’re able to track the conversations around a record and the decision making process. It’s one thing to see the record and the final decision but it’s another thing to look back and see the conversation that led to that decision. Let’s look at records managers in the future. Do you see their roles changing in terms of responsibilities or duties? It depends on the industry. When you’re talking about governments—especially here in the latter years of the Obama administration—there have been several mandates about RM. I think you’ll see more of that in the private sector as well. So if the business is going to evolve around the record, the record manager’s role will have more external visibility because she’ll be fighting corruption, or building trust amongst customers and citizens alike. It might move from a back-office role to a more visible role. Do you think transparency will always be mandate-driven? Oh sure, I think there are some organizations out there that would claim to say “transparency first,” but it’s always easier not to say, than to say. As mentioned before, principled practice is a result of mandates, not businesses suddenly growing a conscience. Besides, transparency lets in too much light. Let’s talk about what transparent records management (TRM) means exactly. It sounds like a lot more future talk to me. When you’re a records manager, you’ll get pushback because the business units are busy bringing in profit or serving the customer. They’ll often find the process of RM arduous and annoying. So records managers will find that people are storing what should be business records on their laptops and phones, which is sort of a nightmare when you’re beholden to certain mandates and retention schedules. I’ve had records managers tell me stories about inventories that they have to conduct where they have to go through workers’ desks. And that can take forever. So TRM is a methodology where you manage records using an ECM system but it’s invisible to the user. The user is able to manipulate the business record as necessary. Once that is done, the user can still find the document but at the same time the records manager is ensured that the document is indeed declared a record and stored according to its retention. I also hear a lot about automated RM. That has to involve robots, how could it not? No, it’s actually woven from unicorn beards. One could argue it is very much the same as TRM, or that it should be. 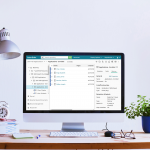 It’s automating the ability to manage records for an organization. It’s transparent to the business, but at the same time a records manager doesn’t have to deal with paper, move files, ship boxes, take boxes from a storage facility and have them destroyed. 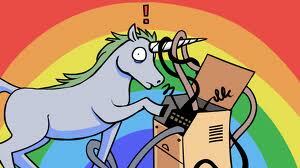 It’s all done vis-à-vis the magic of the unicorn beard and a laptop. The power of organization is in the unicorn beard. Sounds like it makes the records manager’s job a lot easier. I don’t know if “easier” is the right word. I would say more “manageable” but I don’t think technology necessarily solves every problem. Technology is its own beast. It’s like government, you need a series of checks and balances to make sure things are happening as they should—and then things change. Maybe it’s more convenient, but not easier. As we move forward in time, the amount of mandates on various industries will only increase. There will never be less. If you’d like to learn more about how this harmony of objective and functionality is achieved, you can download our PDF eBook, “The Ultimate Guide to Records Management“. I’ll also be conducting more interviews with Laserfiche staff and users, so keep an eye out!